Compliance regulations for broadcast differ across countries. While many regulations are similar worldwide, often culture specific nuances dictate different regulations for certain territories. For instance, a scene involving pork products is considered completely acceptable for playout in Europe, but not in the Middle East. For broadcasters and VoD platforms, failure to comply with regulatory obligations can lead to legal exposure, heavy penalties and even license revocation. In today's era of digital transformation, the process of compliance editing needs to evolve to meet the realities of the 'TV Everywhere' universe, where content is aired simultaneously across the globe not just on television, but also on a host of digital platforms. With regulatory requirements changing frequently across the board, there is a huge need to make the entire compliance process faster, smarter and more cost-effective. To address these challenges, Prime Focus Technologies (PFT) has created an industry first solution that leverages innovative Cloud-based workflows to automate the compliance process, making content distribution to multiple geographies and platforms a whole lot easier. Typically, when broadcasters buy or commission a show, they know which territories it has been purchased for. However, the need to acquire rights for new territories often emerges at a later date. Additionally, even though compliance experts view content frame by frame, broadcasters often find themselves with limited metadata to work with. This means that the same content has to be reviewed and edited multiple times in order to ensure compliance for a new territory, platform and/or regulator. This results in a significant cost, as it entails extensive use of manpower and edit infrastructure. Additionally, as each asset is unique, it is often difficult to predict timelines and calculate resource requirements accurately. Moreover, as multiple individuals need to give inputs during the compliance process, there is also a lack of visibility when it comes to managing aspects like risks, escalations, and quality checks. There is also a constant need to keep abreast with ever-changing territory specific rules and legalities along with socio-political factors that impact compliance regulations. Risks need to be weighed and context arguments need to be built consistently. 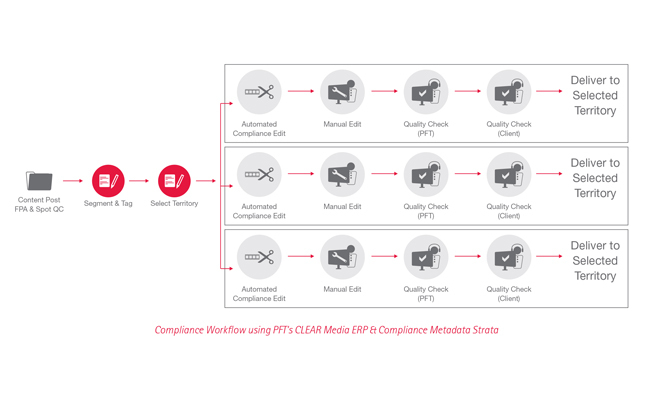 PFT’s flagship product, CLEAR™ Media ERP, offers an industry-first solution for Compliance cataloguing and editing across territories and regions with varied broadcast regulations. CLEAR has in-built parameters of all content considered objectionable by different regulatory bodies. These are based on compliance assessment notes which are often manually written for subjects such as ‘preparation of illegal drugs’, ‘plane crash’ etc. These are coupled with an extensive framework of ‘levels’ that ascertain the type of edit action(s) needed to be taken on a piece of content. CLEAR allows one time tagging of all scenes of an asset for compliance issues, taking into account all conceivable playout scenarios. This includes television playout for general, restricted and post-watershed versions, playout on digital and VoD platforms, as well as hospitality and airline use cases. This one time tagging helps create a rich set of metadata and eliminates the need for full, repeated reviews of the same content. The metadata is useful not only for subsequent compliance reviews, but also for marketing and PR purposes. Moreover, the tagging tool can be easily customized to meet a client’s specific needs. It can capture as little or as much information as desired, and can be easily adapted to meet any changes in territorial regulations. Based on metadata tagging inputs and selection of territory, edit suggestions for each segment are generated on CLEAR automatically and a territory specific EDL is created. The EDL is then reviewed by a seasoned compliance expert, who adds details and makes changes to the actions (if deemed necessary in accordance with compliance arguments). CLEAR enables certain edit actions (like cuts, audio mute/beep, disclaimer/aston and subtitling mask) to be automatically coded into the video, while others (like shot replacement, blurring, and cropping) can swiftly be performed by an editor by following edit suggestions. PFT works with an extensive network of experienced compliance professionals from across the globe, including a host of local resources from different territories. The team also works closely with broadcasters to ensure that they are well in sync with unique editorial policies, as well as subject matter experts based in destination territories to keep abreast with any changes in regulations or socio-political sensitivities. PFT is thus well positioned to scale operations up or down quickly as and when required. CLEAR allows users to log key complaints related to metadata for search and audit purposes within the system. Users can attach complaints, replies and findings against individual assets as well as across a series. Such data can then be utilized to generate a series of dashboards/reports on the status and history of content within the facility. This provides a holistic, insightful view of content performance over time. In the event of complaints, PFT provides an exhaustive rationale for why specific content was included, and also details of the relevant processes undertaken as part of compliance. CLEAR’s comprehensive compliance solution covers workflows for the entire process of compliance from start to end. It offers a unique, holistic way of readying content for distribution to multiple territories without the fear of compliance breach or loss of editorial sanctity. The solution helps future proof content, providing users the ability to revisit content and add/modify territorial requirements at any time without having to repeat the whole process lifecycle. At the same time, it helps enterprises achieve lowest Total Cost of Operations (TCOP) by cutting down the amount of manpower and edit resources in use. Whether you are looking to aid in-house resources or outsource compliance operations completely, PFT offers a flexible rollout that can be tailored to meet your needs. For those looking to keep their compliance editing in-house, the solution is provided on a ‘technology only’ basis. It is also offered as a combination of technology and services to help handle complete content portfolios, consistent monthly volumes and peaks in volumes.